The map doesn't work right. Parts of the map disappear when you zoom in. We can only see the upper left corner of the map. I'm having this issue too. When you enlarge the world map window to either of the two largest sizes, you can see that the bottom-most section and right-most section are blank (grey), and when you move the map around, those sections seem to update in chunks that never completely fill the window. Windows 7 machine, problem visible on 1600x900 and 1280x720 resolution. Incidentally, I'll also note that on 1280x720 resolution, it's possible to make the map window so large that the increase/decrease size controls are shifted out of view, meaning that I can no longer control how large the map window is. 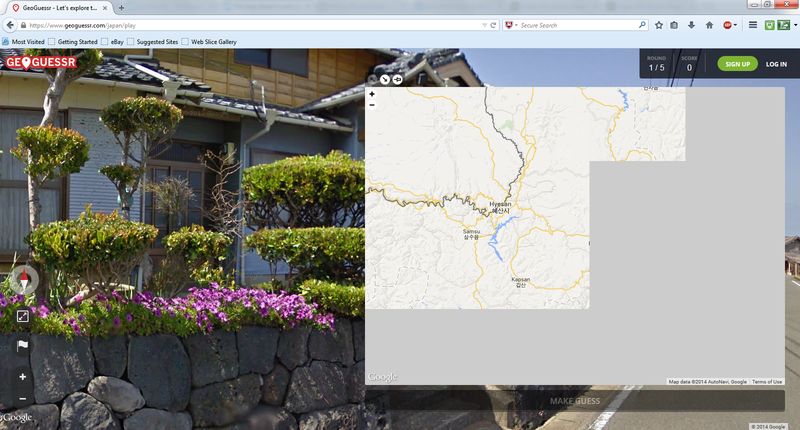 I think you need to limit the size of the map window based on the local resolution, or something. 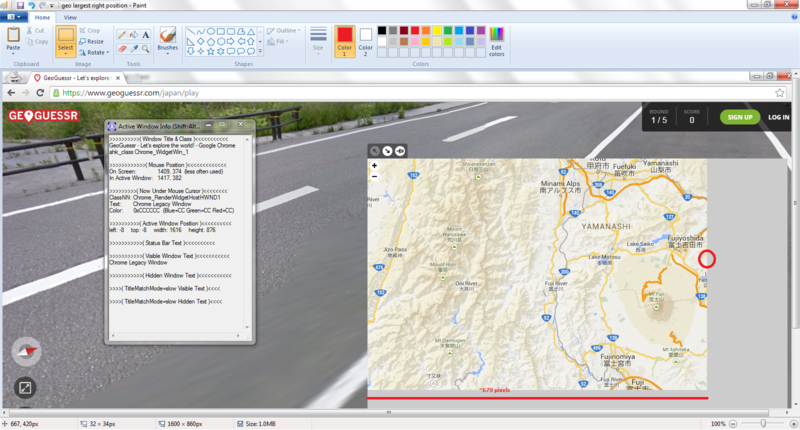 Furthermore, also in 1280x720, it is possible to zoom the map view all the way out (to the point where the world map wraps around on itself) and place your marker far to the 'north' or 'south', off the world. Hi guys. I'm having a hard time reproducing this issue. A few other users have reported similar problems. What browsers and versions are you using? Furthermore, it would certainly help if you could attach a screenshot or two in this thread. Unless Chrome updated since yesterday, I was using Chrome Version 39.0.2171.71 m.
Finally, here's a shot using Firefox 33.1.1. I'm at 1600x900 resolution again, and should mention that the previous post is also 1600x900. I apologize for my crap imgur skills. I've never used the service before. And why not, here's Opera version 26.0.1656.32. In this screenshot, I noticed that I can still place a guess inside the grey space correctly, but I cannot see the marker until I move it into the, uh, not-greyed-out portion of the map window. And to confirm, I can place a marker in the grey space using all of the previously noted browsers, but the marker is only visible when it is on the visible portion of the map. Good luck, Guys. I love this game. Let me know if there's anything else you need. I'll get on my home rig this evening and check things out also. In case the map tile sizes might help, here's some more info in screenshots taken in Chrome, at 1600x900 resolution. Mouse positions are circled in red, and distances are noted by red lines. Windowspy is there for coordinates. The map window is as large as it will go in all screenshots. Here is the smallest viewable horizontal length I was able to get, consistent across all browsers. moving the map any further to the left adds a viewable tile to the right. Here is the total length as soon as that new tile shows up. Here is the smallest viewable vertical height I was able to get, consistent across all browsers, (although in Firefox everything is shifted up about 30 pixels). Screenshots are still in Chrome. Moving the map any further up adds a viewable tile to the bottom, which completely fills the vertical space of the map window. I was able to create some non-uniform bumps by dragging the map erratically; not quickly, just in different directions, one after the other, slowly. 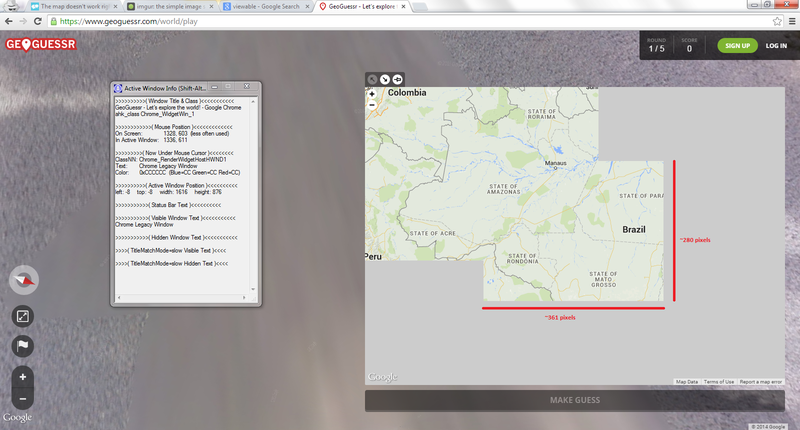 And here's one in Internet Explorer, where I was able to get a visible chunk away from the rest of the visible map. Note that it's vertical height is identical to the Chrome screenshot. And here's another separate chunk in Chrome, with the same horizontal length as the others. Thank you nicepants42 I don't know how to make screen shots this is the same problem I'm having glad you were able to show them. Thank you very much for all the screen shots, this certainly makes it easier to track this bug down. It seems like it might be some sort of bug which affects the asynchronous loading of the map but we have to take a closer look to be sure. We'll do our best to have a fix for this out a soon as possible! I have this problem with all of my computers: chromebook, ubuntu, windows7, running chromium, chrome, and/or firefox. I'm not sure why you can't replicate this bug, because I can't seem to find a single setup where It works correctly. Hi guys. New update out, contains fix for map problems on windows. Please let us know if this is still an issue. 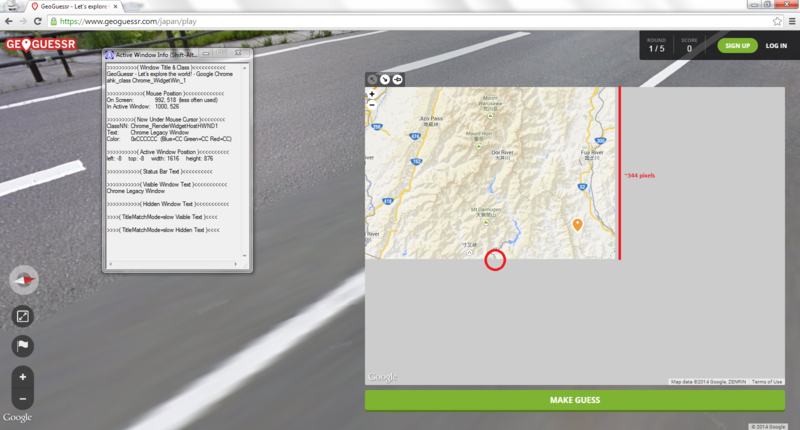 Confirming that the map is working for me on Chrome, Firefox and IE. That's great to hear Nicepants, just let us know if run into any more issues. I have the same problem as above. In the last month it has happens every 15-20 location. Last night I had two perfect 5000 point locations in and the 3rd location had no map. I could place a guess marker and it would move when dragged and zoom in and out, but no map. It seems the bug is not fixed yet. However, there seem to be two work-arounds for me: firstly, make sure you do not zoom in or out very quickly (by scrolling). That seems to trigger the bug for me. 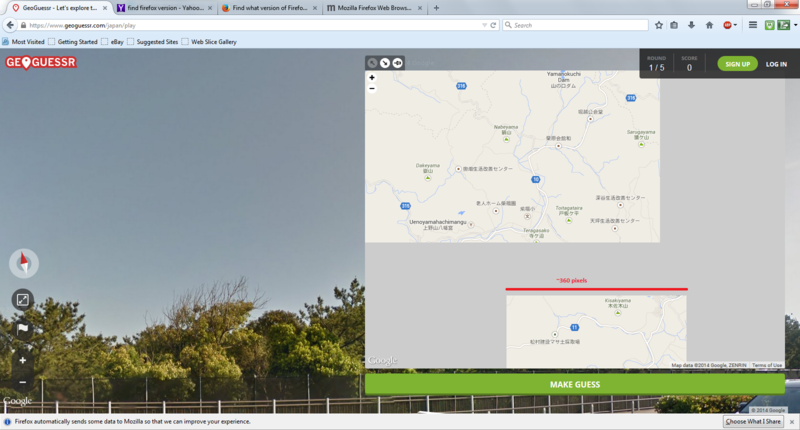 Also, if you enlarge the guessing map, make sure to do that slowly as well. Then, if you happen to have the bug, copy the challenge URL, close and re-open the browser, and paste the challenge URL. Usually the game has been saved, and you can replay the first round you haven't placed a guess on. First off, sorry about this guys. I hope Carel's workarounds work until we can solve this. I can't recreate it at the moment, maybe I'm not able to scroll fast enough to trigger it on my laptop. Could you let us know what OS/browsers you get this with? Thank you for helping us to improve the game! Although I'll note that I generally don't have any problems, and I have reason to believe that my connection speed is fairly choppy. Thanks, I'll keep an eye on it. Hopefully we'll sort it out eventually.. I have the same problem on a more or less updated Gentoo GNU/Linux 64-bit system, with Firefox 43.0 and Chromium 45.0.2454.101. I hadn't played since before an account was (very sadly) required for challenges, and had the same problem back then. 1) Start a new game (single player button on top of the the home page). 2) Increase the size of the map once or twice (the problem does not seem to appear with the default map size, but happens to me with both the larger sizes, as nicepants42 said in the first reply of this report). 3) Let the map close itself. 3) Switch to fullscreen with F11. 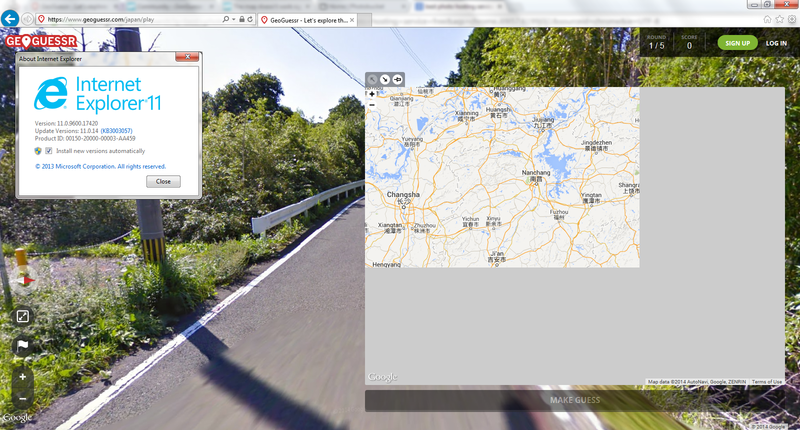 4) Move your mouse to the map. In every single cases there will be gray parts on the sides. If you move in the map, the gray parts will move in appearance randomly and form various gray rectangle shapes, sometimes reducing the visible area to less than a quarter of the map size. For me it seems only to start in fullscreen mode (and with the larger map sizes... it doesn't happen in fullscreen with the default map size). Once it has started however, going back to window mode doesn't always fix the issue. Hmmm... I get the problem when I maximize my browser window too. I have a 1920*1200 screen if its of any importance. The workaround still works when I toggle between normal size and maximized size. So it's not actually fullscreen related. Yup. 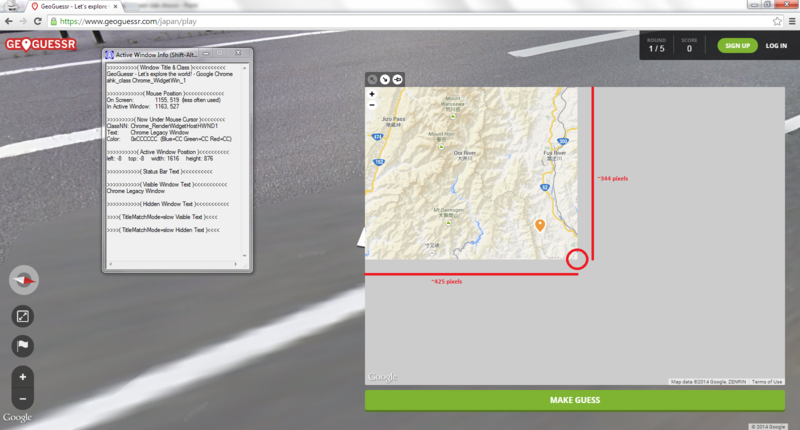 Start a new game, increase the map size, let the map close, resize your browser in any way, even making it smaller, then open the map. Gray areas on the sides. 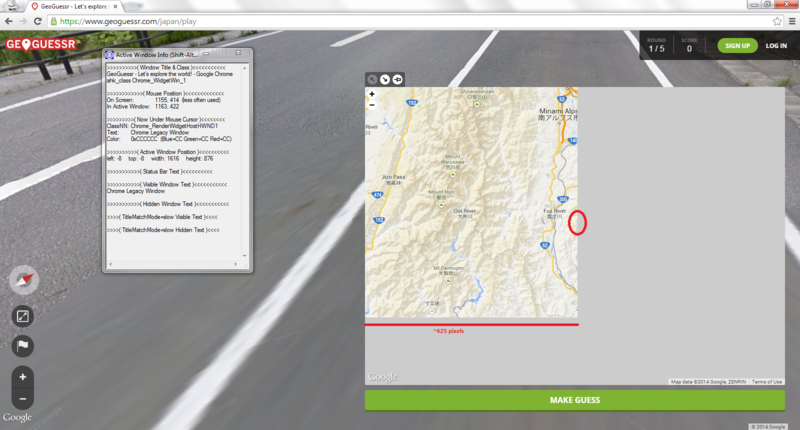 Let the map opened, resize your browser in any way, the gray areas disappear instantly, and won't reappear until you resize your browser window again without having the map opened. Well, hopefully you now have everything to pinpoint the problem 😀 (I probably won't be checking out replies now that I have an easy workaround, sorry I'm lazy for these things :p). (Don't thank me if you're not reconsidering the required email part :p That was a terrible decision... I had started to write a topic about Geoguessr on a forum, and when I noticed an email was required to get a challenge link easily (not having to copy the result link at the bottom of the page and replace "/results/" with "/challenge/" manually...), and for others to play a challenge link, I almost didn't post my topic... I certainly won't start any other topic anywhere about Geoguessr while this policy is in place... it's cumbersome and privacy worrying, whatever your guarantees are today... accounts for this game sure can be useful, but requiring them for basic features is a pain, when you just want to introduce the game and play with random people you meet on the web... Also, while I'm at it, a scale on the map would be most useful... :p estimating distance in Street View can be interesting... but a map is supposed to have a scale, for the distance estimation to be useful... having to estimate both make it cumbersome, unrealistic, and even more approximate...). Wow, fantastic. I tried to copy your findings, and I was able to perfectly in Chrome version 47.0.2526.106 m on W7! Resizing the screen pretty much seems to cause the trouble. I wonder if there are other possible causes as well, 'cause it happened to me a lot in the past, and I usually don't resize my browser window at all. 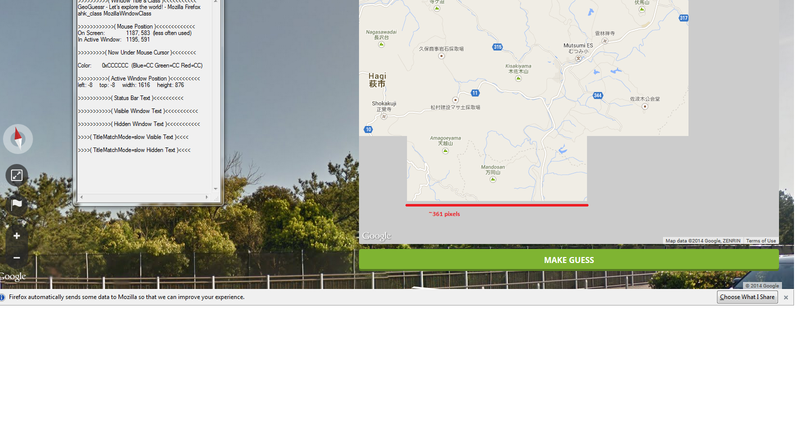 But the work-around of resizing the screen while the guessing map is open, works perfectly, thank you for that! I'm curious if the developers can use this to fix this problem. That was really thorough instructions. It will be helpful to find the issue. Thanks! 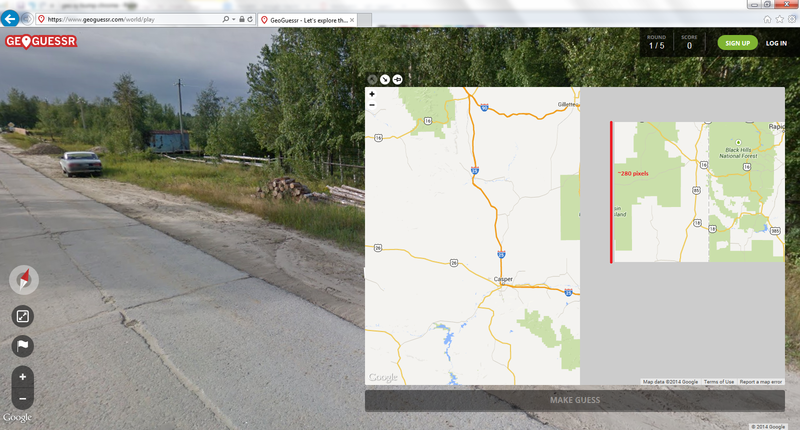 Also noted that a scale on the map would be helpful. I confirm it still exists on Chrome. Thanks for the tips though--I'll not scroll too quickly, and I'll avoid reducing the map size while playing. 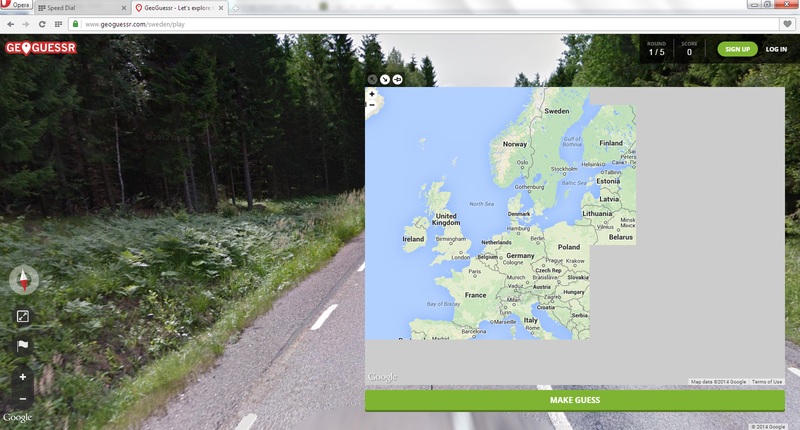 For me Geoguessr map doesn't work. When I start the game the image doesn't appear, just some parts of the image in shape of triangle. Pls help. I'm not able to successfully run the game either when using Chrome (Version 49.0.2623.87 m, latest version as of writing this). But I'm successfully able to run it on IE 11. Attached is my `har` for the page load and a screenshot of what I see and the only error shown in the console. I ran it in Incognito to remove caching and all plugins. A lot of players have reported this issue lately. We're sorry that you can't play, we can't recreate it and we haven't really made any updates lately that could have cause it so we're thinking that it's an issue with google/chrome/java/graphics drivers.. It's difficult to pinpoint the exact reason unfortunately. Some suggestions that other players have tried are, obviously trying another browser, try to move around and make a random guess, keep graphics drivers up to date. Again we're really sorry, please let us know if you come up with a solution! That's great to hear! As Mikael stated above one of the suspects in this case are the graphics drivers, if you want you could also try to disable hardware acceleration in chrome and see if that helps. Sorry, for the (very) late reply. Are you still experiencing problems with this? Nice bot not even checking what Kundo is.